Those few friends and family who still visit this site may have noticed that it was unavailable for much of this year. Our Wordpress installation got hacked in January. It happens. I finally found some free time and decided to try hosting this via AWS. So I exported the posts and images and converted everything to Middleman, which generates a set of static pages. It should be much more difficult for miscreants to exploit. This is good because their crimes tend to be really boring, like generating fake web traffic or inserting spam. "Aren't you afraid of dying?" Calvin said. Calvin smelled like he'd been drinking quite a bit. I met him at the bus stop, but he didn't appear to be waiting for a bus, or at least none of the buses that stopped there. I was still waiting for the 48, and I'd been there long enough that he felt like striking up a conversation. I wasn't particularly interested in carrying my part, and I had a hard time understanding him. So he wandered off. A friendly-looking woman arrived and gave Calvin some sandwiches. She smiled as she listened to him talk. After she left, Calvin walked back to the bus stop, sat down, and snorted. "She was talking to me about church and God. Well, I've been to one of those churches, and they didn't make me feel welcome," he said. He told me about the time he and his family attended a predominately white church, and they felt conspicuously black. He told me no one really helped them feel like they should be there. "Now, I may not go to church, but I believe in God," he said. "Do you believe in God?" I said it didn't make much sense to me, and that there wasn't a lot of evidence for it. "Well, OK, prove it to me, then. Tell me why I shouldn't believe in God." I told him I felt the burden of proof was on the other side. "Aren't you afraid of dying?" I thought about that for a moment, and I told him the truth: I'm not afraid of dying. I'm definitely afraid of getting hurt, though. I don't handle pain very well. But as for my own death, I don't worry about eternal suffering. Nonexistence is neither shameful nor painful, and it's inevitable. A cherished friend committed suicide last week. His body kept working for almost a week, but his brain – nearly all of what made him who he was – had died shortly after he mixed the chemicals that created a deadly gas. The news hit me hard. I didn't see it coming, even though I should have. I worried about him, especially when I heard bits and pieces of news about marital and financial trouble. But he and I had not been in close contact for years. My attempts to reach him went unanswered. I relied on a mutual friend to keep tabs on him and keep me up to date. He called me and gave me the news. A few weeks ago, the only thing that made me feel my middle age was a few gray hairs. I would have said the worst part of getting old was working with colleagues who don't get my cultural references. Today, I know what the worst part of aging really is. It's outliving those you love. So Calvin, if you're out there and remember our conversation, let me rephrase my answer: When my time comes, there shouldn't be any reason to fear death. But I'm afraid of death visiting my family and friends. I don't ever want their time to come. Just as I'm getting ready to leave the state (more on that some other time), three Nevada bloggers from across the ideological spectrum have come into their own to cover politics quite nicely. First you have my former colleague Steve Sebelius with his soapbox SlashPolitics. Steve is aggressively smart and a riot in person. It comes across in his writing as well. Then there's Josh Hicks and his very thoughtful, almost restrained Of Note Nevada. Josh comes to the commentary business with quite a bit of government experience, including a stint as chief of staff for Governor Jim Gibbons. His tone is judicious, well-informed and clear. Finally, there's Anjeanette Damon, another former colleague of mine. She tends to play it straight – even in her blog, Inside Nevada Politics – and when she's not being furloughed she does a fantastic job of keeping everyone updated on the things that matter, whether it's momentous budget agreements or tawdry episodes of poor judgment. If you live in Nevada, you should really be keeping up with all three of them. Hey there! If you attended my presentation today at the Nevada Interactive Summit, I'd appreciate it if you could let me know what you thought of it. Thanks! Update: Click here to get a PDF of the entire presentation, along with my notes. I've placed it under a Creative Commons license, so let me know if you'd like it in another format. Most news organizations have been slowly shrinking both their budgets and staffs in the face of a vanishing market. Both insiders and outsiders are divining what went wrong and how to adapt to a new world of publishing. There are at least as many different opinions and strategies as there are keyboards. Even in a world composed of ceaseless chatter, journalists are a verbose and opinionated group. It's not that anyone's appetite for news has diminished. It's just that they didn't want what traditional media was serving, or maybe how it was being served. It's easy to focus on the particular details – the foolishness of considering a daily newspaper a breaking news medium decades after television stole that away, the rank arrogance of newspapers after the disappearance of true competition, or the excessive focus on packaging, at the expense of the product. These are just some of the complaints advanced as reasons for the decline, but whether they're true in whole or part, they don't explain much. The truth is far more complicated, and has more to do with the new rhythm and pace of the average person's life than it does with journalists. I've mentioned context in another post,and there's no need to elaborate on it here. It's more interesting to visualize the future of news, especially in light of the latest announcement by the Detroit Media Partnership. Many people in the industry have been wondering which major metropolitan daily would first switch to online-only publication. The well-respected (but rarely read) Christian Science Monitor recently made the news when it announced it would stop printing and publish only on the Internet, but they're a different kind of publication from the daily metropolitan newspaper. It seems that the Detroit JOA is showing that, instead of a radical break with the past, we might see a more gradual move away from print dominance to a more complicated distribution system. They're still going to print a daily newspaper, but they just won't deliver it to homes for most of the week. On its face, it seems a fairly bold step, at least for newspapers – they focus their print efforts on the days where they get most of their print revenue (82 percent is the number I've seen). But when you break the daily newspaper habit for home readers, you stand a very good chance of breaking their print habit entirely. After all, once you get used to reading it online for four days out of the week, why not give up the print subscription? In any event, it's a great move for everyone else, because the results will be extremely illuminating. It's not a trend yet, but eventually most newspapers will face similar choices. Not all of them, as John Duncan points out in an excellent post. John has always been good at pointing out the obvious fact that for-profit media organizations are businesses, and should be run as such. It's a refreshing viewpoint and moves away from the overall hand-wringing mentality that dominates media industry discussions, conducted mostly by folks who yearn for simpler times that they understood. But really the discussion should not be about what New Media is or isn't, or what the future of Journalism is or isn't. It should be focused on the simple questions, like "What do our customers really want and how much are they willing to pay?" Or given that newspapers have at least a decade of experience with the Internet, "Are our online operations still worth it for our particular newspaper?" Other newspapers might ask, "Should we lay off 90 percent of our staff and publish only on the web?" For some newspapers, the right online presence is just a self-serve interface to their customer account, or even just a brochure listing contact information. For others, maybe the right print presence is no presence at all. These basic questions don't seem to get discussed much by the right people. I do see a lot of newspapers pouring time and money into their online presence with only the conviction that it's the future for their business. I'm not so sure they've really thought about what that particular future looks like. The only thing I know is that it doesn't look like their past, with its increasing revenues and comparatively high margins. It looks lean and small, even in good years. For most newspapers, it may be the only future. But it shouldn't come as a shock. Privately, I've mentioned to friends that the collapse of newspapers may not be such a bad thing in the long run. I've compared it to whale falls: When a whale dies and its corpse falls to the ocean floor, its nutrients can support a host of organisms. In a similar way, when a large media organization disappears, it gives smaller, nimbler enterprises room to breathe, in the form of advertising dollars and readers. Alternatively, most newspapers may not close up shop, but just fade and compete with other small news startups, or even passionate amateurs. One of the reasons I quit the business is that even though I could see what was broken and doesn't work, I didn't have a clear idea as to what it would take to fix it. Gannett certainly had a plan, and I was happy to help implement it until it became obvious that it wasn't going to work either. Kevin Kelly's recent manifesto "Better Than Free," clarified things, in the sense that it frames the problem in a clearer way. I've been thinking, off and on, about the points Kelly raises, and how they would relate to a news organization. I think this long and rambling post is part of that process. I can see a local news organization (or more) thriving, not just surviving in the future. I don't see all the details yet, but I see enough that makes me happy. One of the reasons I switched jobs earlier this year is that after a year and a half of media management, I was getting excited about programming again, thanks in no small part to the joy of working with Brandon Mitchell, a smart programmer and all-around decent guy. I jumped at the chance to develop and maintain software in an academic and scientific environment. One of the decisions I also made at the time was to change my text editor. For a programmer, the choice of editor you use to write code is a personal statement similar to the one made by participants in the Ford vs. Chevy debate, and argued over in terms that approach religious and political debates. It's not surprising, since it's where we spend so much of our time. But for the normal folks who spend most of their day in Word or Outlook, it's a little mystifying. I'll try to explain. I decided to give Emacs another chance. I had tried it several times before, but you must realize that Emacs requires a huge time commitment to learn and use proficiently. It has a unique interface and vocabulary all its own. 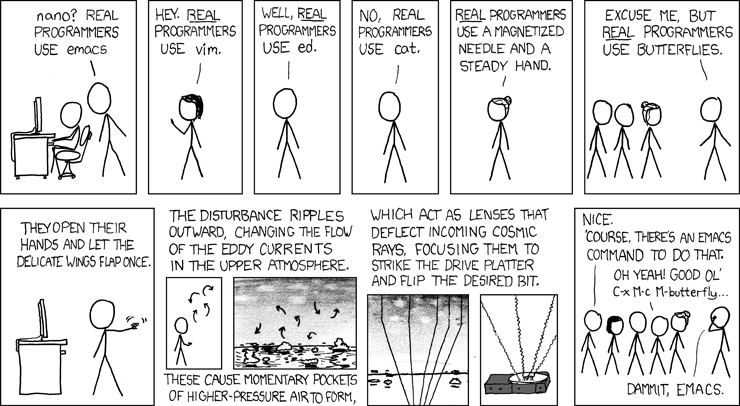 Emacs is not just an editor, but an entire programming environment. This makes it both an extremely powerful tool and a dangerous waste of time, as you spend time creating the "perfect" work environment, at the expense of the work you were brought in to do in the first place. It's funny, trust me. But I'm burying the lede, so let's get back on track. Emacs is an old piece of software. It dates back to the mid-70s, when I was just a little boy. It's been under constant development since then, and not only is it still actively developed, there is a tremendous amount of free code out there that gives Emacs almost any capability you could want. One reason for this lively community is that Emacs itself consists of a large amount of easily mutable code built on a small, fast and more fixed core. It's designed for tinkering. Of course, so's Microsoft Word, which doesn't quite have the same community or amount of free software, even though it has far more users. In some ways, it's because Microsoft is more interested in providing opportunities for businesses to make money selling software, which is an admirable goal. But I also think it's because changing Word's behavior is less fun and less elegant, and the people who use Word are also much less likely to attempt to learn how to change it, even if they have a strong need to do so. The Star Wars reference is particularly apt in relation to Emacs customization, which for a programmer is a lot like a Jedi building his own lightsaber. The problem with Emacs is that in order to get the editor you want, you'll probably have to write your own code, and integrate a lot of other people's code as well. It's what I did, as everyone did before me. Your Emacs will necessarily be different from mine and anyone else's, sometimes radically so. If you use more than one computer – say, one at home, and one at work, or a laptop and a desktop – this leaves you with the problem of keeping your Emacs configurations consistent. The obvious solution, since your Emacs configuration is a bunch of files full of code just like all the other software we produce, is to put your home directory under version control. Also called source control or revision control, this is the software most programmers install right after setting up their editor and their programming language of choice. It's like an unlimited Undo on steroids, or Apple's Time Machine feature. My version control software of choice is git, which is a much more recent piece of software, about three years old. It's quickly become the flavor of the moment and the version control of choice for some very high-profile and important projects. It's a wonderfully flexible tool. Using both Emacs and git together made me think about their relative ages, and about how when seen in the history of tools in general they may as well have been developed on the same day. One of the largest uses of the Internet still involves reading text like this blog post. The written word has been in use for thousands of years, and it's an essential part of our daily life. Even the most sophisticated technological artifacts are designed in large part by using text – text to describe them, discuss them, define them, and finally implement them in a way that a computer can realize in a more physical way. It's easy to look at our new computers and think about the changes to daily life, especially if you still remember when the sound of typewriters echoed in the office. I like to think about the cherry-picking of technology we do on a daily basis. I sit at my new workstation and use a cutting-edge version control system to maintain a thirty-year-old editing environment that uses a fifty-year-old computer language rooted in a technology that's been with us for about 6,000 years. It puts the novelty of the moment into perspective, and it's humbling to imagine attempting to contribute to that history in some way. 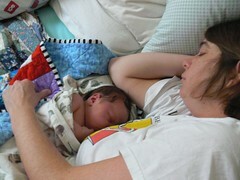 Here's a photo of Ivan and Rachael, taking a nap after the big event. You'll find more on Flickr. Ivan Joseph Levy was born at home at 12:55 PST today. He weighed in at 9 lbs., 3 oz. Both Rachael and Ivan are doing well. I'll have pictures up shortly. There's this idea that lean, successful organizations should focus entirely on their “core,” their primary reason for existence. But of course, even if you are, say, a news organization, you still need to make sure your people get paid, someone installs the desks and the workstations and the software, and all the myriad little details that go into a day’s work. So before long you have finance departments, IT departments, a person who takes care of travel arrangements, etc. These fall into the general category of “support” departments, and when the budget rubber hits the road, they also tend to get the shaft because they are considered cost centers not central to the business at hand. If you can outsource it, so much the better. This is all fine and well if your core business truly operates independently of your support departments. If you can outsource most of your payroll and finance and save money and time, great. But if your business depends on having smart and well-trained accountants and analysts to do interesting (and legal) things with your cash, then getting into a vendor relationship where you spend part of your day working around their procedures and haggling with them over the terms of the contract is going to cost you more money over the long term. Because you’ll be hiring people to fill in the gaps and glue the two systems together. And this won't be a fun job, so you’ll be dealing with higher turnover costs. Software engineering is one of those things that most organizations never gave any thought to. The larger organizations may have had a data processing department stuck somewhere, working on fairly well-defined behind-the-scenes processes. But software didn’t drive your day until we started installing terminals, soon to be replaced by PCs. At that point, software became central to you day. And here's the thing about software: It’s not a commodity. It’s not something general-purpose like a chair or desk. It doesn’t just become a part of your day: Its capabilities — what it makes easy and what it makes hard — determines what you do during the day and how you do it. Finished software is a business process that’s difficult to change. You’re seeing that right. Saxotech is designed so that every paragraph of every story gets put into its own box. This runs counter to decades of word-processing interfaces, let alone centuries of experience with the written word. The reason given for this design is that it allows the system to insert content between arbitrary paragraphs, say by putting an ad after paragraph 3. This seems legit until you realize that you can actually handle this task perfectly well inside the software itself, and you don't have to burden a human by making it part of the interface and thus making their day that much more difficult. Extra keystrokes, mouse clicks and time for each person who uses the system adds up very quickly when you look at it over a year: Never mind the additional performance hit you take by putting every paragraph into its own database row. Your average blogger has a faster and cleaner content management system available to them than most online newspaper journalists. Do you wonder why blogging grows so quickly in popularity and capabilities? Do you wonder why bloggers can move faster and do more? Is this the kind of system that makes it easy to publish across multiple platforms? We can’t change this, and the people who can have very little incentive to change it for us. Oh sure, we can bring it up at contract negotiations, but unless the vendor shares both our strategic and tactical concerns down to the very last employee, we’ll always be arguing over details and we’ll never be pleasantly surprised by innovation. You can reward innovation after the fact, but you can’t pay someone beforehand to deliver it to you. You can only hire the best people, encourage them and get out of their way. That last statement is fairly well-worn. But we have to stop considering software engineers as something exotic, positions only software companies have to worry about filling. If your organization is based on information — meaning it produces or aggregates it in some way — there is no black box or silver bullet you can buy that will eliminate the need for smart people who know how to create or couple together your business processes — your software. You have to have good software engineers to help you shape the information and come up with innovative ways to deliver and present that information. This is also why open-source software will remain a viable option for some time to come. What you lose in contractual support you gain in freedom of movement and a guaranteed level of innovation. Microsoft, no slouch in developer support itself, has made every effort to push forward its own free or nearly-free solutions. When you add the skills and institutional knowledge of passionate software engineers who have your strategic interests in mind, the results are amazing: Just look at sites like LJWorld, SavannahNow or IndyMoms. With services like Amazon’s Elastic Compute Cloud you should think long and hard before insisting on managing your own NOC and worrying about SLAs. But note that you’ll still need someone to write the software. Someone to worry about your processes in excruciating detail. Someone to come up with new ways do do old things, and new things to offer your customers, and actually be able to implement those ideas. I can’t think of anything more central to an organization that produces or distributes information.